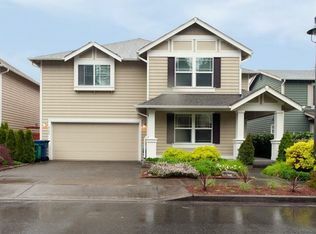 Lovely Redmond Ridge home offers a spacious floor plan of 4 large bdrm w/ walk-in closets + bonus rm upstairs. Double doors leading to a large mstr bdrm with 5-piece updated bath. A versatile 5th office/bdrm on main with adjacent 1/2 bath. Bright and open kitchen with granite counter, new SS appliances, maple cabinets, hardwood floors, gas fireplace in family room. Spacious pantry/mudroom leading to garage. Rosa Parks Elementary.